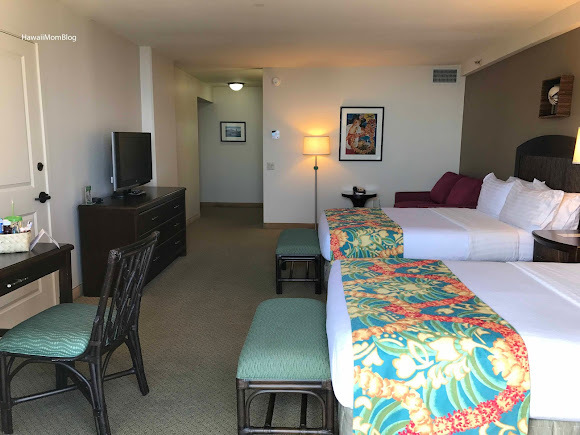 Although I've been to the Holiday Inn Resort Waikiki Beachcomber numerous times to dine or to watch a show, I never stayed there until a few weekends ago! 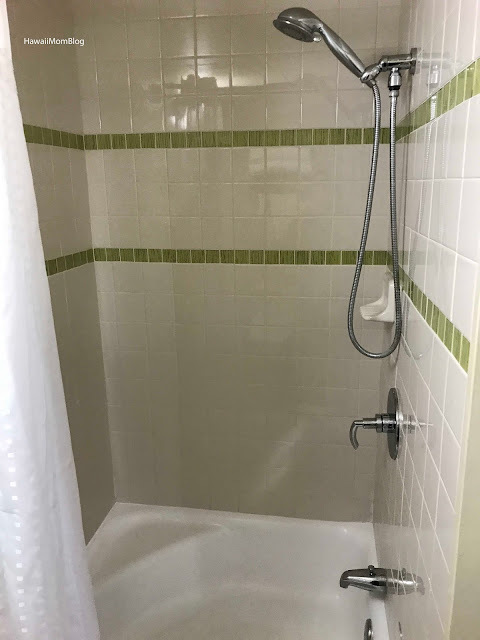 That was also my first time staying at a Holiday Inn property! 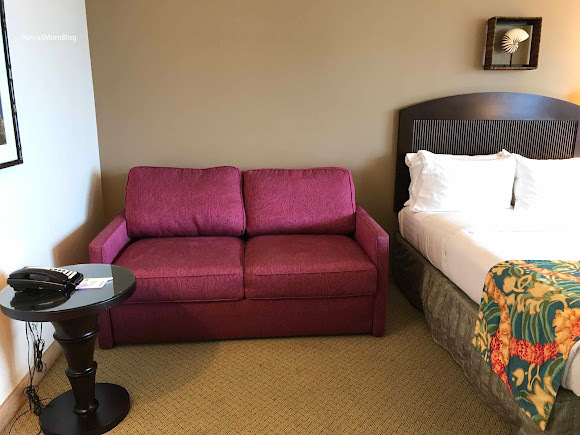 Our Junior Ocean Suite was spacious - great for a family of five like my own, with two double beds and a double-size sofa-sleeper. Inside the room was a flat screen TV, a desk, a small table, and a mini-refrigerator. The bed benches and chairs provided extra seating, and I appreciated that there were numerous outlets to plug in all of our tech. 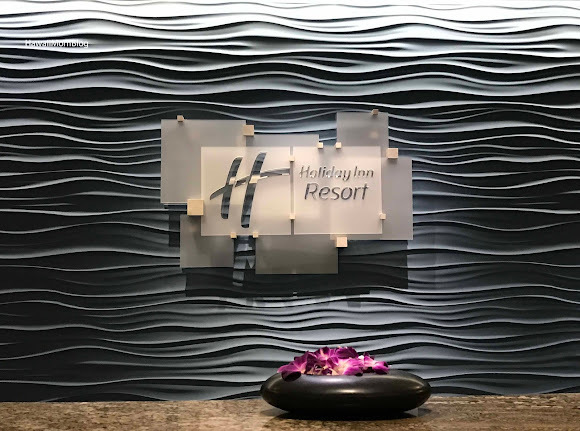 The beds were extremely comfortable, and I love that Holiday Inn Resort Waikiki Beachcomber offers a pillow menu so you can find the perfect pillows to get a good night's sleep. The shower was on the small side, but I liked that the vanity was separated from the toilet and shower. 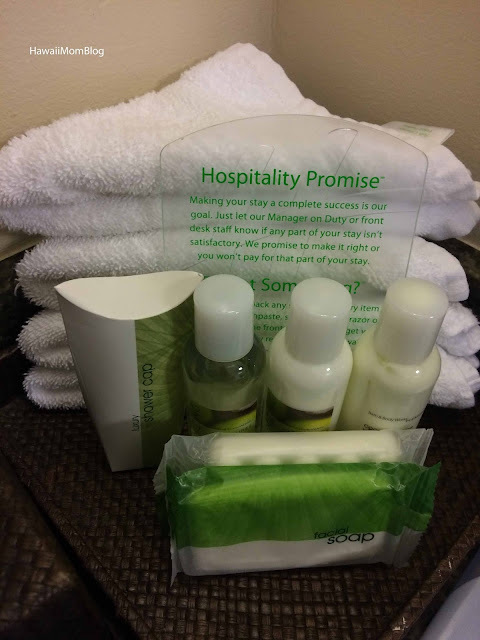 The room came with Bath & Body Works amenities, and the "Forget Something" Program offers a replacement toothbrush, comb, or other standard toiletry item, if needed, free of charge! 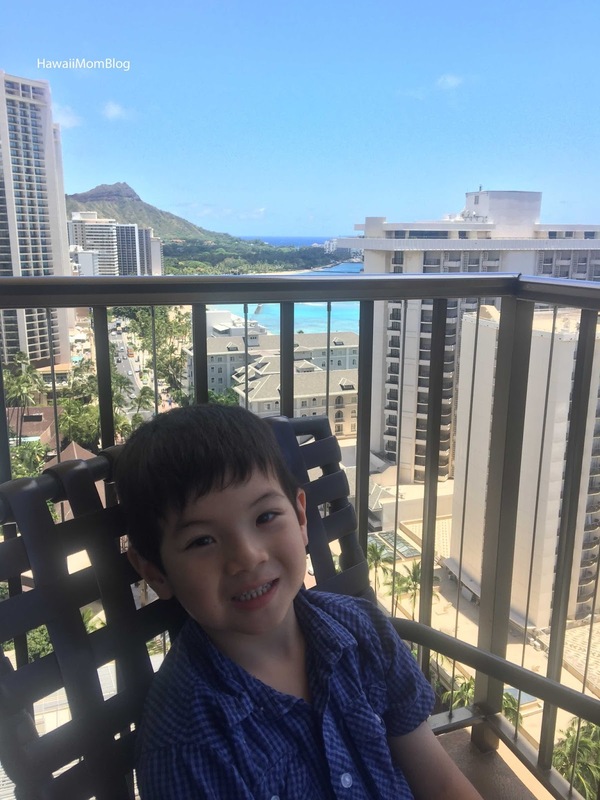 We had a gorgeous view of Diamond Head from our corner balcony, as well as a lovely view of the ocean. 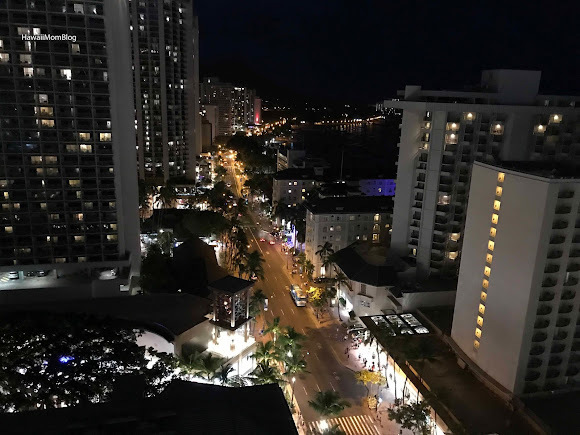 At night the city lit up as cars and pedestrians made their way through Waikiki. 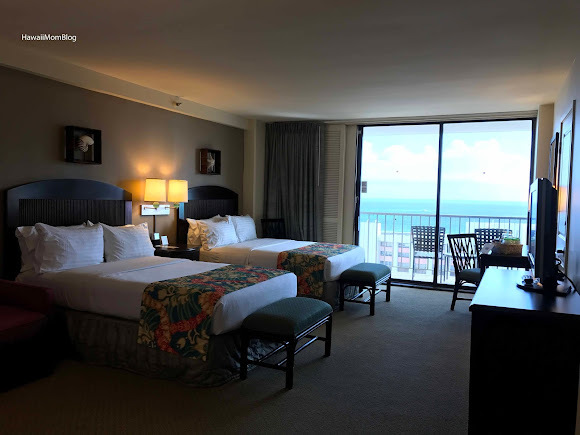 The sliding doors leading to the lanai are not sound-proof, which meant at night we could hear lots of noise from the street - sirens, work trucks, even people talking loudly, so if you're a light sleeper, be sure to pack some earplugs! 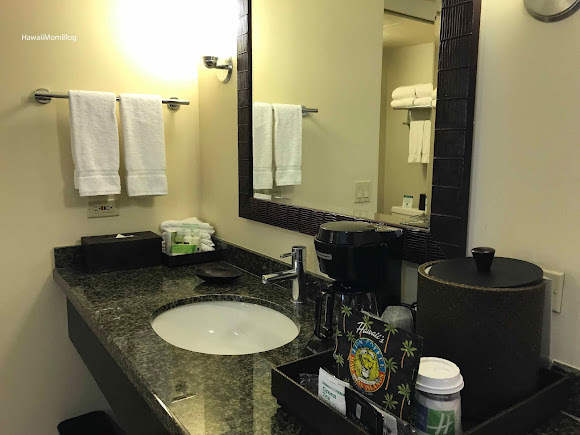 The 496-room hotel is conveniently located on Kalakaua Avenue - just across the street from Waikiki Beach and the Royal Hawaiian Shopping Center, and right next door to the International Market Place. 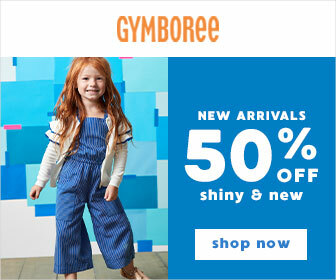 You don't have to leave the hotel to shop or dine though! Maui Brewing Co. and Hawaiian Aroma Caffe are on property, giving guests convenient options for breakfast, lunch, dinner, and even happy hour! Macy's is also on the ground floor, so if you have the urge to shop, just take the elevator or escalator down to street level! On property you'll also find a small pool, a business center, fitness center, and a gift & sundry shop. 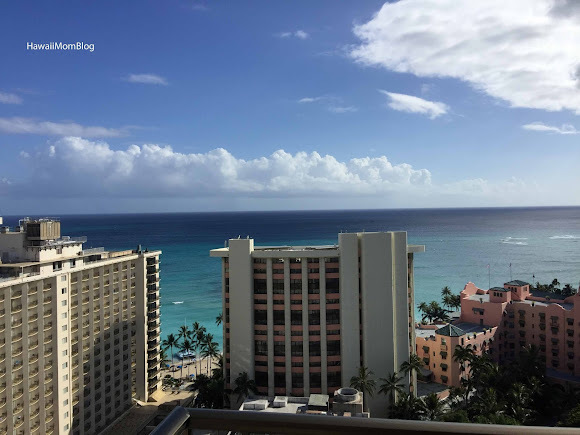 A Waikiki Connection Fee of $20 a day per room entitles guests to unlimited rides on the Waikiki Connection Trolley, a Shopping and Discount Booklet, an exclusive Beachcomber Drawstring Tote, and more. 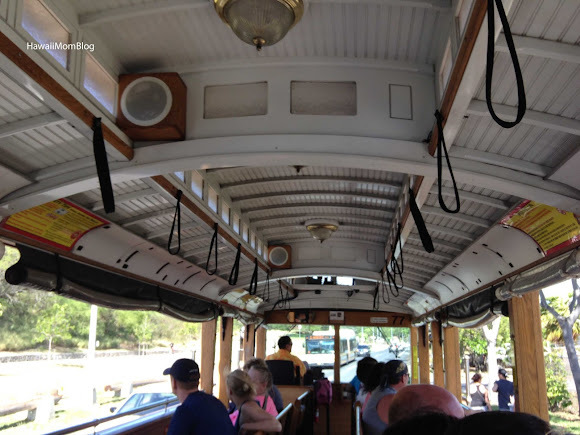 The Waikiki Connection Trolley takes guests to many popular spots, such as KCC Farmers Market, Diamond Head Crater, and the State Capitol, which means no need to fight traffic or hunt (and pay!) for parking when you take the trolley! 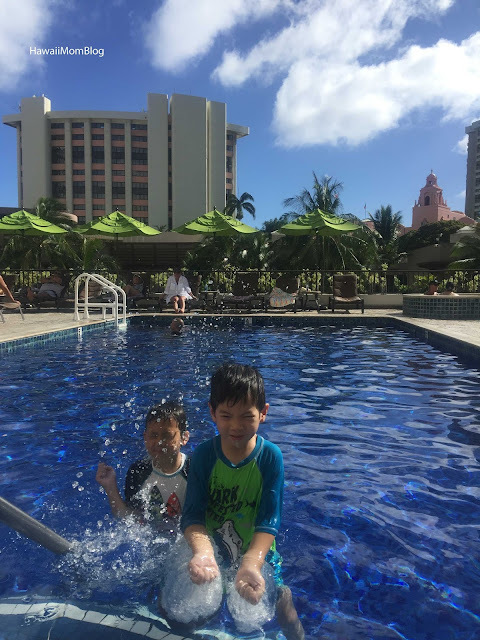 The Holiday Inn Resort Waikiki Beachcomber provided our family with comfortable and convenient accommodations and a variety of amenities, resulting in a wonderful first experience at a Holiday Inn property! Mahalo to the Holiday Inn Resort Waikiki Beachcomber for the media rate. Parking and Waikiki Connection fees were waived. 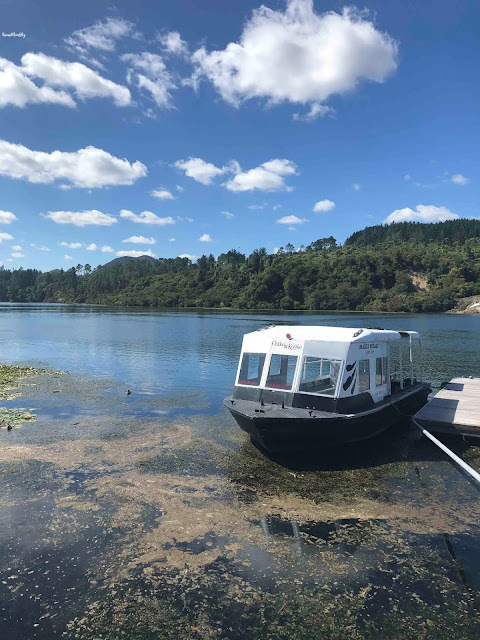 Gratuities were paid on our own.